Congratulations to the 2017 Morrison Exon award winners! Leaders from across our state nominated volunteers in the various award categories. An Awards Committee then reviewed the applications and our State Executive Committee approved the final award recipients. We are proud of the accomplishments and leadership of volunteers across our great state helping elect Democrats. The award winners embody the values of the Democratic Party. Take a look at the historical listing of award winners. The Bob Kerrey award is presented to volunteers who personify the spirit of the Nebraska Democratic Party. 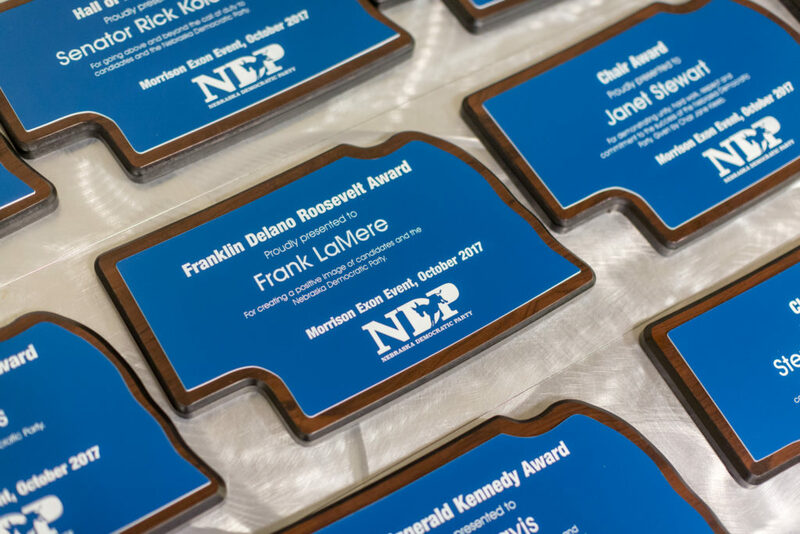 The award is given to individuals who work tireless in supporting the Nebraska Democratic Party activities and campaigns for Democratic candidates, and creates a positive image of the Party and its candidates within the 1st, 2nd and 3rd Districts respectively. Mike has helped countless Democrats in their campaigns including Senator Ken Haar, Mayor Chris Beutler, Scott Kleeb, Councilwoman Leirion Gaylor Baird and myself. He is a tireless, dedicated volunteer that epitomizes the phrase “hard work wins”. Mike once called over 400 voters in one weekend on behalf of Senator Ken Haar and called voters for two years with me during my legislative campaign. He is an outstanding Nebraskan and I and so many others in this great state are lucky to know and call him a friend. Rachel has worked tirelessly to support the Douglas County Democratic Party and is a Central Committee all star. Rachel worked with Douglas County Democrats to coordinate our Truman Dinner, Bowling Events, Liberal Libations, and ran point on our silent auction. She is always available to lend a hand to help build the party. Rachel has proven herself to be an exceptional organizer, fundraiser, and advocate for the Party and candidates. Terry Wegner is the epitome of a dedicated volunteer. Terry has done the dull, boring, volunteer work for various campaigns including Nelson, Kleeb, Domina, Hassebrook, Dubas, and Quick. His approach to delivering signs, putting up signs, picking up signs, literature drops, calls and monetary donations was with good humor and politeness. Hall County Democrats saw his support in the floats he built, the paper machete donkeys and his ability to show up for everything. His fine reputation for reliability, hard work and good cheer represents the best of the 3rd Congressional District and the Nebraska Democratic Party. An individual that has shown exemplary service in energizing and supporting young Democrats in the state of Nebraska. Meg Mandy has spent over a decade working to elect Democrats across the country, and at all levels right here in Nebraska. Meg has done everything from local school board races to gubernatorial campaigns and was even part of the team that delivered CD2’s electoral vote to President Obama in 2008. Along the way, Meg founded the Omaha chapter of the New Leaders Council, an organization dedicated to developing a new generation of progressive leaders with the skills they need to work for social justice and a strong democracy. Under her leadership, the Omaha NLC has received multiple awards for fundraising from the national organization. Most recently, Meg was the campaign manager for Senator Tony Vargas’s historic legislative campaign which delivered the first Latino Democrat to the Unicameral and where, together, they have already achieved many important victories for working families across the state. Someone who is dedicated to improving both the Nebraska Democratic Party and their community. This award is given in honor of Carrie Howard. We are proud to give the Sunshine Award to the volunteer team that elected Patricia Koch-Johns to the State Education Board from Lincoln. The volunteers are Inonge Kasaji, Kaylie Hogan-Schnittker, Cooper Christiancy, Brodey Weber, Michael Maly and Maluba Mudundulu. On Election night 2016, the election of Patricia (Patsy) Koch-Johns to the State Board of Education was a god-send and a bright light of hope on an otherwise bleak night. They worked hard over the course of just over six months to catapult Patsy to victory. They put together a total campaign strategy for fundraising, walking, calling and meeting voters. Facing a high-profile, well-funded opponent, they were the little campaign that could in 2016. Great attitudes, fantastic work ethic, cooperation with other campaign efforts to create the best outcomes. These are the kinds of efforts that will catapult other Democratic campaigns to victory! A young person honored for their exceptional volunteer activities and participation within the Party. This individual is active in energizing other young Democrats with Nebraska Democratic Party ideals and principles. Mina’s involvement in politics began at the tender age of five when her Dad asked, “Who is the President of the United States?”. Since then, her first formal encounter with politics and community service was when she chose to join John Ewing’s Congressional fellowship program and President Obama’s fellowship program. President Obama’s program taught Mina how to organize events, and she learned the first step was to hit the pavement to communicate with people. Recently, she was a national delegate for Nebraska for Senator Sanders and she knocked on 600 doors for mayoral candidate, Heath Mello. Mina served as the President of Creighton’s Young Democrats chapter. As the daughter of a veteran and an immigrant, life was not always so easy. Even though they didn’t have a lot, her family was always empathetic towards others. Mina has marched for Public Education, organized a food drive for a mom who lost her job, helped Charles Smith avoid eviction, helps middle school kids in speech competitions and other small acts that have helped individuals get through tough situations. A volunteer who personifies the spirit of the Nebraska Democratic Party. The award is given to an individual who is tireless in supporting the Nebraska Democratic Party activities and campaigns for Democratic candidates, and creates a positive image of the party and its candidates. Every generation, organization, Party, or nation will need a leader to help bring them out of the wilderness. Frank Lamere is the our road warrior who is doing this for us. He acquires “road dust” and always reminds the public being a “partisan” is a good thing because it means you are standing on a side and proud to be a Democrat. For years, Frank worked to end the injustice of White Clay and just this month the final word because of Frank’s dedication to our party’s values came down on the side of Lakota people. A County Party officer who has worked tirelessly to promote the activities and values of the Democratic Party in their county and throughout the state. This individual has served, or continues to serve as an officer of their county party in the last year. They demonstrate a dedication to service, integrity, the organizing of their county party infrastructure, and support for local Democratic candidates. John attended his first fundraiser in September of 1960 when Bobby Kennedy came to Hastings and was the keynote speaker at an event for Jerry Whelan who was running for Congress in the old 1st District. He got to meet and have a brief visit with Kennedy after the dinner. In 1968, he volunteered to set up chairs and county signs in preparation for the State Convention in Hastings. In 1972, he was elected in the May primary as a delegate to the 1972 national convention in Miami, the first of four National Conventions that he has attended. Over the years he has participated in numerous campaigns at the local, state, and national level including McGovern, Morrison and Nelson. In 1974, John was elected as Treasurer of the Adams County party and has been reelected to that position every four years since. Possibly, making him the longest serving party officer ever. An elected official who is dedicated to the principles of the Nebraska Democratic Party and who has contributed above and beyond the call of duty to the Nebraska Democratic Party and Democratic candidates for public office. Senator Kolowski has never been afraid to stand up for the principles of the Democratic Party and has shown that Democrats can win without compromising their values. He is a supporter of a strong public education system; a protector of the environment advocating for clean water and renewable energy; and he believes in the good life for all Nebraskans. Senator Kolowski knows the good life includes: supporting Nebraskans who are DACA recipients, supporting employment protections for LGBTQ Nebraskans, as well as supporting expanding health care to cover all Nebraskans. He has also supported Democratic candidates running for office and has mentored his then Legislative Aide, Anna Wishart, and encouraged her as she went on to run and be elected to the Legislature. The Party’s Chair every year recognizes a leader who embodies our Democratic values. The Democratic Party faced an intense primary season in 2016 for the Presidential nomination. The word “unity” was used at the DNC Convention and during the campaign to bring all Democrats together. Two women in our Party embody the word and give new meaning to the word unity. Janet Stewart and Stephanie Matejka both proudly supported their candidates–Sec. Clinton and Sen. Sanders. Once the primary was over they both came together to help heal the heart of our Party–the grassroots Democratic base. Through trainings, events, meetings and yes, tears, both Janet and Stephanie focused first on people and always on bringing the Party together for our common good.